You are probably tired of me talking about stews. In the fall and winter months I make soups and stews at least once a week and I must say they are one of my favorite foods. If you read my blog regularly you know that both by how much I talk about my love of soups/stews and how many recipes I post. I promise that come spring I will be back to lighter fair, but until then stews will be a staple. It helps that both of my sons are huge stew eaters. So much so that my son's birthday was this past weekend and that was what he requested for his birthday dinner. Love that kid. Beef stew is probably my favorite type of stew. It is comforting and re-heats well for lunches. 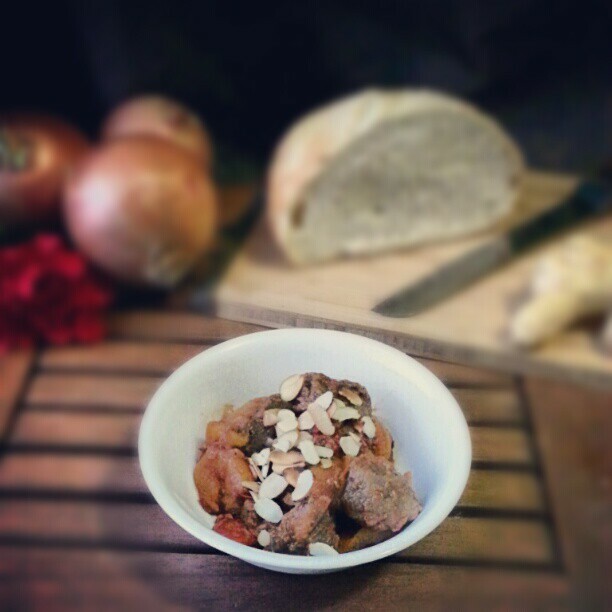 Last weekend I tried a new recipe for Beef and Apricot Stew from Everyday Food (the last issue-boo! ), which looked simple and perfect for fall. This recipe has 11 ingredients. It takes a total of 1 hour 55 minutes, 25 minutes of which is active and makes 6 servings. I had no problems finding any of the ingredients at my local grocery store with the exception of the lamb which was supposed to be the main ingredient. I have a horrible time finding lamb in my area. I am hoping that since we now have a new International market that I might have more luck. Since lamb was non-existent I substituted beef. Two things that I would change about this recipe. The ginger sticks weren't popular in my house. Instead of making sticks I would suggest grating the ginger on a micro plane. This would allow the flavor, but not make large sticks of ginger which my kids pretty much hated. Additionally, I would cut down on the amount of apricots to 1/2 cup. Using 3/4 of a cup of apricots was just too many. I followed the remainder of the recipe as written. With an hour and a 1/2 in the oven this recipe takes a little bit of pre-planning. However, any good stew is worth the wait. If you implement the changes that I made above I think this stew could be a great fall and winter staple recipe. Plus it's gluten free which works great for my dietary needs. For the recipe go to Beef and Apricot Stew. This sounds like such an interesting recipe! It really was good! I followed you back, I love all the vintage clothes! I hope you come back soon :) Followed you back!